Shu is the owner of the shadow Blue Dragon, which often uses magic sword attacks. 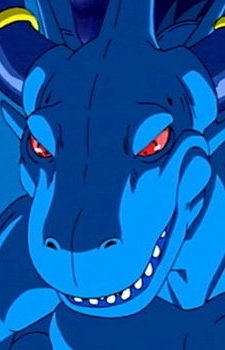 In the anime, Blue Dragon at first doesn't cooperate with Shu until their fight with Ivanov and Gustav when Shu managed to gain enough power to control him. For most of the anime, he is quite insulting towards him and constantly criticizes everything Shu does. The Blue Dragon is in fact depicted as having very violent personality, and is extremely cold, not caring about anything or anyone but himself.